The story of Latvia's first stamps shows the adaptability and ingenuity of a new nation following the devastation of the First World War. Latvia was invaded repeatedly by Germany and Russia during World War I. Germany’s defeat and the Russian Revolution weakened both countries, thus enabling Latvia to declare independence, which it did on November 18, 1918, one week after World War I ended. The war had caused a severe paper shortage but there was one source of top-quality paper – military maps left behind by Germany’s Imperial Army. Latvia’s industrious government printed its first stamps on the backs of these maps. 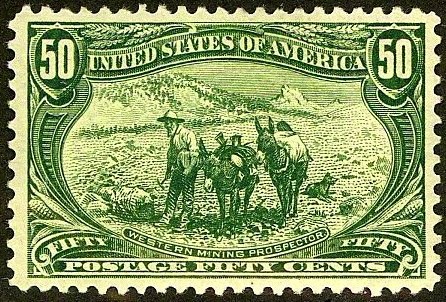 To save precious paper, stamps were printed in 12 rows of 19 stamps each for a total of 228 stamps per sheet. 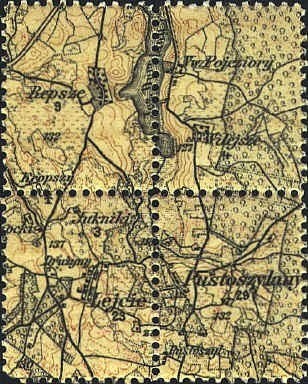 On the reverse, each German military map features a section of Latvia, complete with name, scale and map grid position. A total of only 11,956 sheets were printed. 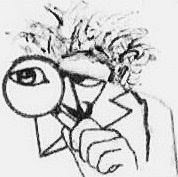 Of those, only about 4,900 were perforated. 4,750 sheets were delivered to Latvia’s government in the period between 1918 and 1919. The shipment included imperforate gummed sheets (Latvia Sc. #1), and perforated gummed sheets (Latvia Sc. #2). After the Latvia Post began operations, the Bolsheviks invaded the capital city of Riga. 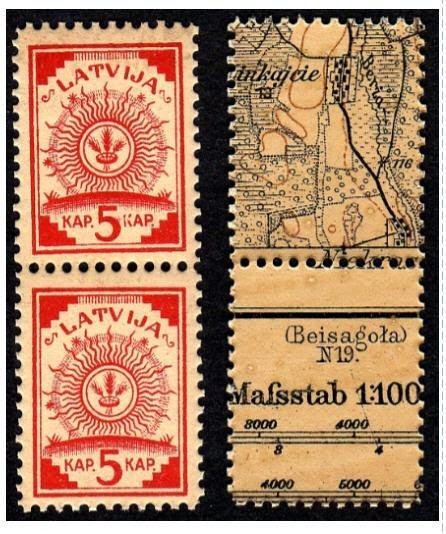 An unknown quantity of Latvian map stamps survived the destruction.